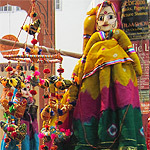 The marionettes of Rajasthan are known as kathputhlis or string puppets. The community that makes them and performs with them are the bhatts who wander from village to village with their puppet show during the dry season when cultivation is not possible. The puppets are small in size — about two feet in height. They are stylized, and have a wooden head and large eyes. The rest of the body is made of cloth and stuffed rags. The wood used for the head is mango wood or akada root. The cloth used for the body is soft and light to allow for free movement. The kathputhlis have highly exaggerated immobile features with enormous noses and wide eyes. Unless they are horse riders, the puppets have no legs. They are covered with a long pleated skirt. 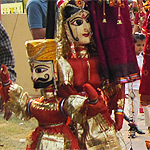 The puppet has a long string for the head which reaches the manipulator and then joins the waist; the strings from the two hands of the puppet are joined in the hands of the manipulator. The costumes are regional and traditional. 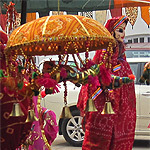 The themes are Rajasthani historical tales or local legends. A few characters and items like the court dancer, stunt horse rider, and snake charmer, are a must. 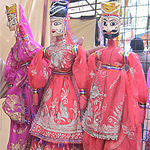 The main centers where the puppets are made are Jaipur and Jodhpur.